Cheap synthetic ice – is low cost artificial ice worth it? More and more synthetic ice brands are popping up in the market and many of them are offering cheap, budget and low-cost prices for their plastic ice. As you may know if you put cheap plastic sheets on the floor you can already ice skate on it, that question is, is i t realistic? Is it fun? You well know ice-skating on plastic is not fun. Synthetic ice Technology matters. Since regular white plastic looks exactly the same like high grade synthetic ice in its look, people think they get a a super deal if they get an exactly similar looking product for half the price. So let’s keep it simple, if you want to have synthetic ice that really works, meaning, that you can ice skate on and have a realistic gliding feel, and where the glide- and grip ratio is optimal, than you have to pay a higher price. With plastic ice it is like that: you get what you pay for. First you need to analyse how many more ice skaters will repeatedly come and skate on your synthetic ice rink. 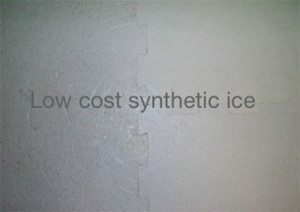 How well they talk about your synthetic ice? How many friends do they bring along to ice skate on your plastic ice? You know very well that counted over several years this can be a significant number. You also know that this can make or break your business. However, we do not have to stop here. How much more costs does your business have if you have to sharpen skates 5 times as much with your cheap fake ice compared to a high quality synthetic ice? How much does it cost you clean up all the synthetic ice flakes and artificial ice shaving because your plastic ice rink produces 10 times more such peal off’s? This extra operational costs can be tremendous? Let’s say you purchase a synthetic ice pad and you want your son to have the best training conditions so that he can progress, become a NHL star or simply you need to pay for less coaching because he advances much faster? Or your hockey students advance much faster, have more fun? It is very important to calculate the real costs of synthetic ice product and calculate the implication of a cheap plastic ice product on your overhead. We know, this calculation is very complex and you have to factor in many details. We from the Glice® team are very happy to assist you in analysing your real synthetic ice needs and analyse the true artificial ice rink quality implications for your situation. Please do not hesitate to contact us and we will be happy to assist you in very thing you need to know to make sure your synthetic ice business will be successful. We also highly recommend that you read our Synthetic ice Buyer’s Guide. Thanks for the interest Jesse. Could you please specify from where you are writing to us? You can do this by filling in a contact form on: https://www.glicerink.com/synthetic-ice-rink-contact-buy-rent/. We will send you a quotation asap. Hi Loufel Aleonar, thanks for your inquiry. One of our Sales Consultants will contact you by e-mail to provide you all required information. Kind regards from the Glice® team. Hi please fill in our contact form on: https://www.glicerink.com/synthetic-ice-rink-contact-buy-rent/ and our Glice Representative of your region will contact you and provide you the exact pricing of our Glice® synthetic ice rinks. Hi Thom, Thank you for contacting us and your interest in Glice® Synthetic ice! Please fill in our contact form https://www.glicerink.com/synthetic-ice-rink-contact-buy-rent/ and one of our Sales consultants will contact you and provide exact pricing. Kind regards from the Glice® team. Please send pricing . Thinking of purchasing for our ice skater. We leave in Durango, Co.